Confidential Landfill – Southeast USA > Provectus Environmental Products, Inc.
An operating landfill generated ca. 26,000 lbs (or 3,050 USG) of leachate annually that contained organic constituents of interest (COIs), namely Trichloroethylene (TCE) and para 1,4-dichlorobenzene (DCB). Historically, the leachate was handled on-site or placed in 55 gallon drums and disposed off-site. However, changes in regulatory policies represented a significant increase in cost of operations. Provectus was tasked with providing a cost effective option for treating COl-impacted leachate on site in a safe, reliable, timely and cost-efficient manner. Provect-OX is an in situ chemical oxidation (ISCO) / enhanced bioremediation reagent that uses ferric iron (Fe III) as a safe and effective means of activating persulfate (Patents Pending). Using a combination of reactive oxidizing compounds such as persulfate (S2O8-2) persulfate radicals (SO4•) and ferrate (Fe+4/+6). As such, Provect-OX oxidizes a wide variety of organic compounds present in impacted soil, sediment and groundwater, including chlorinated solvents, petroleum hydrocarbons, and pesticides. Notably, Provect-OX is uniquely designed support long-term (>2 years), enhanced bioremediation process to actively manage COI rebound. Provect-OX applications range from about 0.1% (soil dry weight basis) for low concentration dissolved plumes up tp 10% (soil dry weight basis) for highly impacted residuals. It can be conveniently packaged in a single, pre-mixed bag for ease of use and safe handling. Moreover, due to its safe and non-extreme activation chemistry, Provect-OX will not generate excessive heat or generate large amounts of off-gases that complicate field applications. 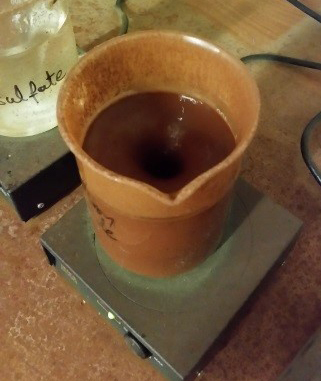 Leachate samples contained 0.011 to 0.022 wt % solids and small amounts of NAPL as <1 mm droplets. The leachate was treated with 0.1 lb Provect-OX per gallon of leachate (ca. 1% weight basis) or 0.5 lb Provect-OX per gallon of leachate (ca. 6% weight basis) and incubated alongside an unamended control. Chemical analyses were conducted on duplicate samples after 0, 3 and 5 days of reaction in sealed microcosms maintained at ~20 ºC. Ignitability tests were also conducted. Heat: No heat was generated during the reactions of Provect-OX with the leachate (data not shown). pH: The pH of the untreated control samples ranged from 5.03 to 5.61; with a trend of decreasing pH over time (Figure 1, average of duplicate samples). 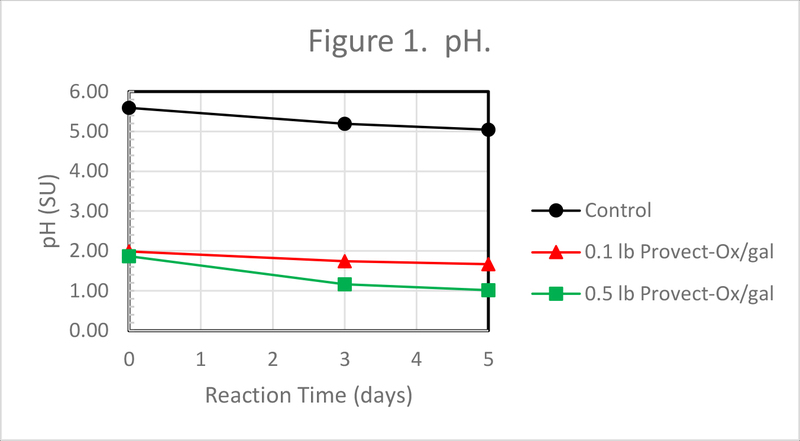 The addition of the Provect-OX immediately lowered the pH by 3.5 to 4.0 SU, and there was a trend of decreasing pH with increased reaction times from 0 to 5 days. Leachate pH less than or equal to 2.0 would be classified as Characteristic Hazardous Waste due to corrosivity. Hence, for full-scale application, simple post-treatment pH adjustment may be required, or the concentration of ferric oxide in the Provect-OX could be reduced. Solids Content: As expected, the addition of the Provect-OX increased the solids content of the leachate from about 0.02 to 0.53 wt. % (Figure 2, average of duplicate samples), but this is much less than that typically observed with permanganate (data not shown). 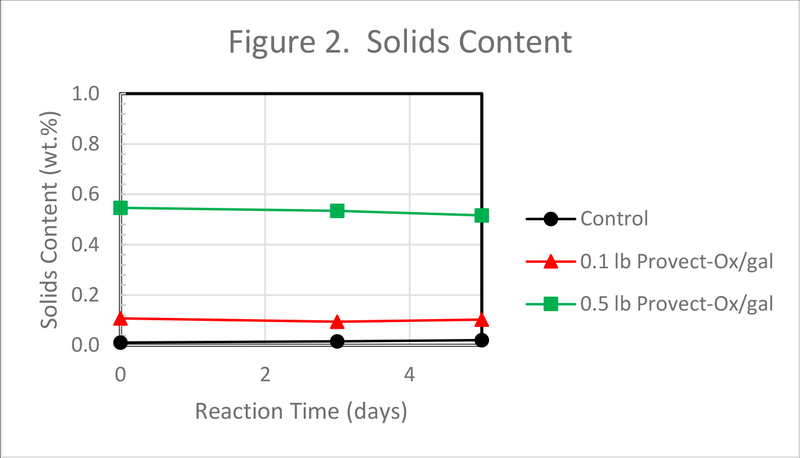 The solids content was consistent over time for any reagent addition suggesting that the solids were the result of the reagent addition alone; i.e., chemical reactions over the 5-day period did not contribute additional solids. The 0.5 wt % value is important with respect to RCRA because if the solids content is less 0.5 wt % than the leachate is defined as a liquid waste and the filtrate passing through a 0.6 to 0.8 µm filter is defined as the TCLP extract for subsequent analysis. If there is equal to or more than 0.5 wt %, the solids need to be collected on a 0.6 to 0.8 µm filter for subsequent TCLP extraction and analysis. TCE Removal: The TCLP maximum concentration of TCE for the Toxicity Characteristic is 500 µg/L. 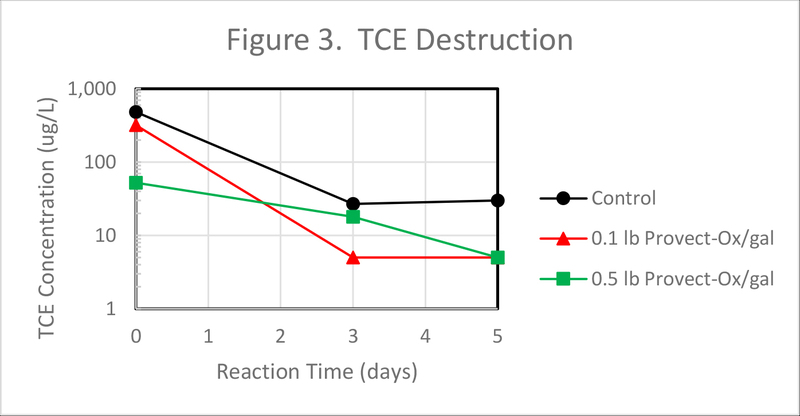 Both dosages of Provect-OX reached the reporting limit of < 10 µg/L of TCE in leachate (unfiltered) in 3 to 5 days of reaction time (Figure 3 – average of duplicate samples). However, there were some losses of TCE in the control samples. 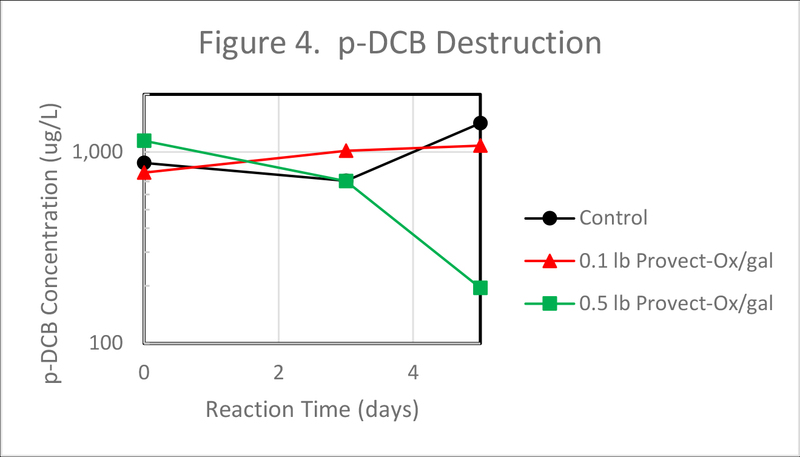 1,4-DCB Removal: The TCLP maximum concentration of p-DCB for the Toxicity Characteristic for is 7,500 µg/L .The lower Provect-OX dose appears to have had no effect on p-DCB concentrations over the 5-day period (Figure 4 – average of duplicate samples . However, by Day 5 there was a significant ~5-fold decrease in concentrations from over 1,000 µg/L to less than 200 µg/L 1,4-DCB in leachate (unfiltered) in the presence of Provect-OX at 0.5 lb/USG (Figure 4 – average of duplicate samples). Solids TCLP: Since the aqueous contaminant concentrations are significantly below the hazardous waste TC limit, we do not see the need to generate a screening level TCLP value using the small amount of solids available. Ignitability: Data from flammability samples (data not shown) were generally inconclusive, with all samples having values around 130 F (US EPA Method 1010a).